As the Commonwealth Games approach, Coral Drouyn discovers the lid is off on a spectacular season of Arts on Queensland’s Gold Coast. We all remember the Gold Coast. Whether it’s from childhood memories of the beaches, sun, and surf, or schoolies week, or the theme parks; or having your picture taken with rainbow lorikeets perched on your arms and head. What we don’t remember it for is The Arts; those honours belong to our state capital cities, but all that is about to change. With the Commonwealth Games set to open in mid-April, with estimates of more than half a million international visitors, the Gold Coast is re-inventing itself and officially adding THE ARTS to its attractions. The Arts Centre has even changed its name to HOTA, an acronym for Home Of The Arts, and its refurbishment now includes a sensational outdoor amphitheatre which officially opened on March 15th with a free concert from Tim Minchin - the tickets were gone in 30 minutes. The new Amphitheatre will also feature concerts from the QSO, Neil Finn and a Global Orchestra event with 100 musicians playing Holst’s The Planets under the stars in a Concert For The Planet, which will be live streamed globally. Revered New York experimental doyen Laurie Anderson will be Artist in Residence this year, with a wide range of offerings including a Concert for Dogs (you can’t say The Arts isn’t all inclusive). There are cultural events, major productions and a huge range of facilities. There are two theatres, an amphitheatre, three Arthouse cinemas, the showroom, a late night cabaret venue, studios and workshops – just last week Bangarra Dance Company gave a FREE contemporary dance workshop for intermediate level dancers, as well as theatre performances. And this is all in one amazing location on the side of the river, where you can stroll in the moonlight or have drinks in the bar. I can’t think of another Arts Centre that offers more. But while all of that is impressive, a city needs a unique Arts Festival to really lay claim to being a cultural hub. Fortunately the Gold Coast has one of them too. Bleach* Festival is the brainchild of the peripatetic and indefatigable Louise Bezzina (picturd right). It’s the only Arts Festival I can find which is dependent on its location. Without the Sun and the surf, the parklands and the estuaries, there would be no Bleach* Festival. 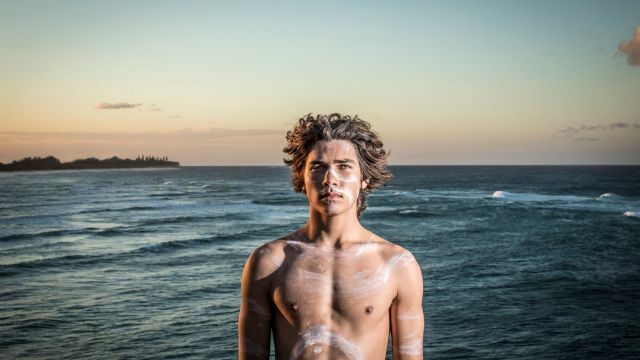 A new full scale rock opera, The Spirit of Churaki (commissioned for the festival) tells the story of the first indigenous life saver. With music by Violent Femmes founder Brian Ritchie, and starring Leah Flanagan, a great indigenous singer, it will be staged on the beach and in the surf. The sensational dance company The Farm will present Tide, where two men are trapped on an island in an estuary through a series of low and high tides for 48 hours (yes, that is two days). Audiences drop in and out when they feel like it and can swim/wade to the island and interact in the performance. That’s not something you are ever going to see at a Melbourne Arts Festival, and believe me, The Farm is a multi-award winning company, headed by the unique talents of Gavin Webber. The Farm offers another show, The Ninth Wave, an apocalyptic champagne party on the Surfers Paradise Beach for “fools” to celebrate the end of the world. Both of these productions are free. In fact, over 80% of the offerings in the Festival are free, and that’s also part of Louise’s vision. Since its relatively humble beginnings in 2012, Bleach has grown at an amazing rate. This year there are over 140 performances with 10 world premieres and 20 commissioned productions. In 2016 Louise was awarded Business Woman of the Year for Arts and Culture for the Gold Coast Women in Business Awards. In 2014, Bleach* Festival, under Louise’s direction, co-produced and presented Opera on the Beach, in partnership with Opera Australia. In her role as Artistic Director for Bleach* Festival, Louise is part of the Creative Lead team for the Gold Coast 2018 Commonwealth Games Arts and Cultural Program. And those are just credits. In reality Louise, mother of two very young children, is a powerhouse of energy who had been an administrator and co-ordinator on major Arts events in the city, but whose husband was transferred to the Gold Coast. It’s a formula which sees each production linked organically to its location - like an audience participatory kyak paddle and performance on Currumbin Estuary. Along with Bleach* and HOTA, there is also the Gold Coast’s own Festival 2018, which opens with a free concert from Yothu Yindi and Treaty Project and presents incredible installations and shows from around the globe, including giant Karaoke for all, on the beach, with hundreds of microphones. With Festivities kicking off on March 29th all the way through to April 15th, The Gold Coast is indisputably the place to be for entertainment – oh, and I heard there’s some sports on too.